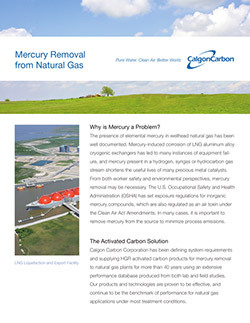 Calgon Carbon Corporation has been defining system requirements and supplying HGR activated carbon products for mercury removal to liquid natural gas plants for more than 40 years using an extensive performance database produced from both lab and field studies. Calgon Carbon's granular activated carbon (GAC) offers superior adsorption properties for the purification of liquid natural gas. Activated carbons in pellet form are available for specific treatment applications in the treatment of liquid natural gas.